studies about the safety food in CD patients. excess presence of the amino acids proline and glutamine. is activated as part of the first inflammatory response . who do not strictly comply with a gluten-free diet (GFD). are the single most important predisposing genetic factor. tion by the enzyme tissue tranglutaminase . demonstrated in patients with CD. autoantigen (Tissue Transglutaminase: tTG) are known. viduals goes well beyond the classic enteropathy of CD. diet is, on the whole, strict . 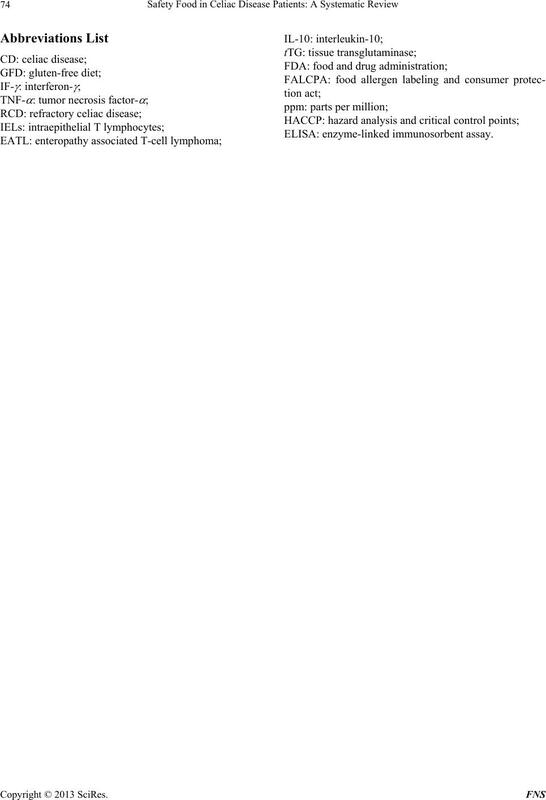 teropathy-associated T-cell lymphoma (EATL) [31-33]. sone, cyclosporine and interleukin-10 (IL-10) [38-43]. banana diets at celiac patients . the harmful effects of wheat flour . associated with celiac disease . 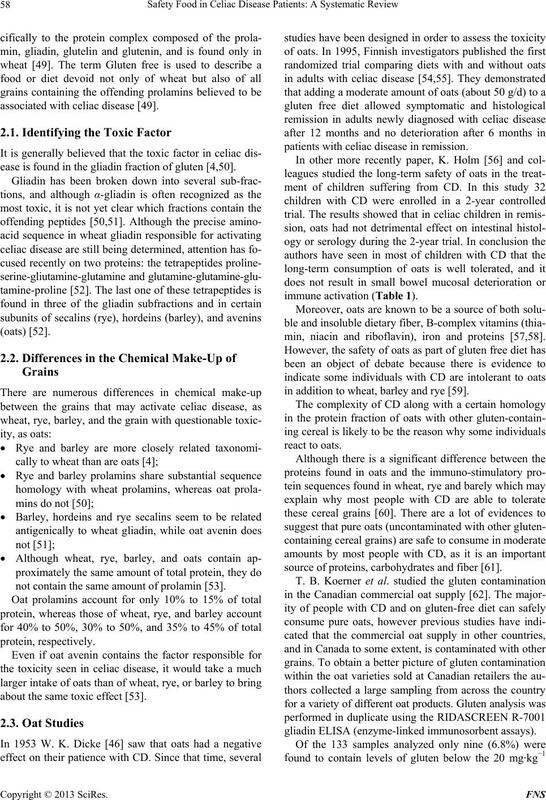 ease is found in the gliadin fraction of gluten [4,50]. not contain the same amount of prolamin . about the same toxic effect . patients with celiac disease in remission. min, niacin and riboflavin), iron and proteins [57,58]. in addition to wheat, barley and rye . source of proteins, carbohydrates and fiber . gliadin ELISA (enzyme-linked immunosorbent assays). Table 1. Characteristics of included studies on oats effects. nation levels to this study. oats were excluded in the GFD until recently, when E. K.
cell infiltration between the two groups. tients with celiac disease . the avenins of different varieties (cultivars) of oats . ered oats safe for consumption by adults. wheat, rye, and barley) be used . zations continue to advice against the use of oats [73-75]. histologic changes to the intestinal mucosa . their oat products are free of contamination . 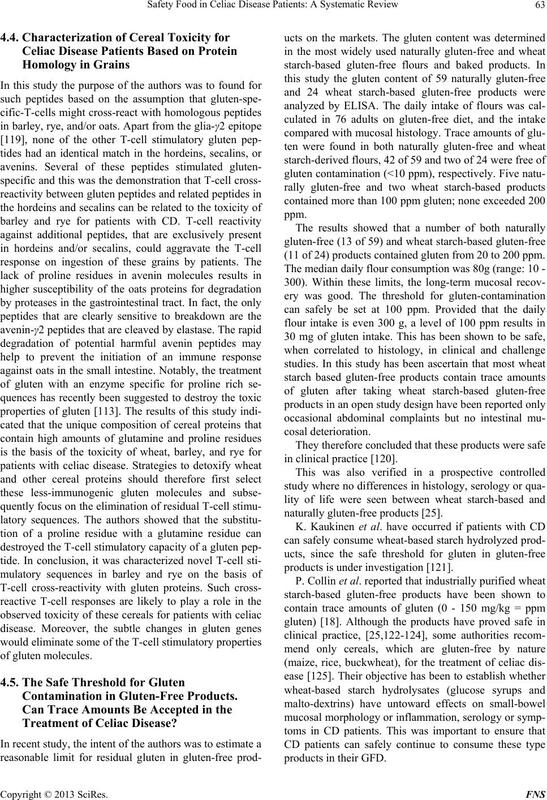 of calcium, non-starch polysaccharides, and vitamin D.
lity of GFDs should be considered. nesium and zinc in remission celiac patients . mg intake daily ; higher than 50 mg per day . and fiber of celiac patients . that oats had a positive effect on GDF . portion of the gluten-free diet. and type 1 diabetes . with gluten free diet [98,99]. more parts per million (ppm) of gluten . Commission set levels for usage of GF at 20 ppm or less. product is safe to consume or does not contain gluten. components in celiac patients . ω fraction from wheat, rye, and barley prolamins . proximately 15% of proline and 35% glutamine) . T-cell epitopes, is highly proteolytically resistant . gluten present in foods can be established more precisely. detect oats is of potential practical importance. tract (20 mg/L) for CD patients . 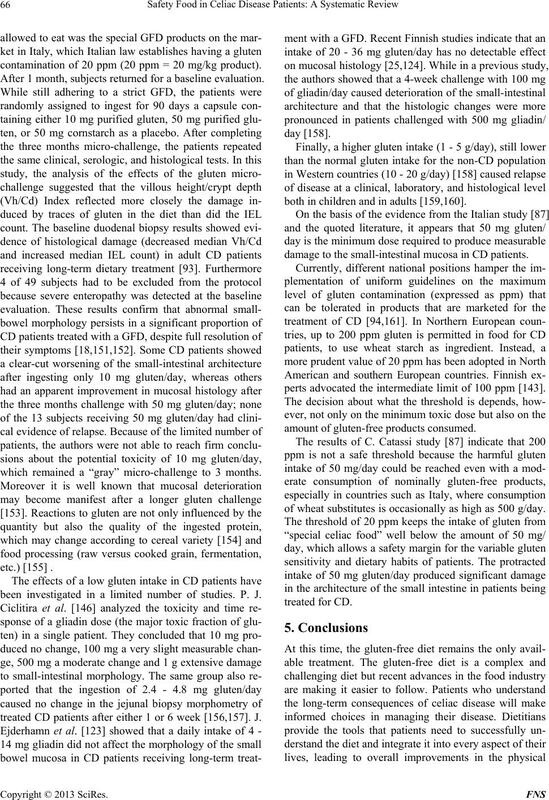 (11 of 24) products contained gluten from 20 to 200 ppm. products is under investigation . safely continue to consume these products. oids, azathioprine, or both) before entering into the study. ous reports in adults [127-130]. to the duration of exposure to gluten. even small quantities of gluten from diet may be harmful. 2 weeks of initiating the gluten-free diet. entirely to the gluten free diet [44,139]. tion, credible resources and support groups. labels or by contacting food companies. cult if not impossible to maintain [18,92,93]. of gluten-free designated by CODEX Alimentarius . because gluten contamination is very common in food. trace amounts of gluten is still unclear. the architecture of the small-intestinal mucosa . threshold of prolonged exposure to trace amounts gluten. contamination of 20 ppm (20 ppm = 20 mg/kg product). After 1 month, subjects returned for a baseline evaluation. which remained a “gray” micro-challenge to 3 months. been investigated in a limited number of studies. P. J.
treated CD patients after either 1 or 6 week [156,157]. J.
both in children and in adults [159,160]. damage to the small-intestinal mucosa in CD patients. perts advocated the intermediate limit of 100 ppm . amount of gluten-free products consumed. of wheat substitutes is occasionally as high as 500 g/day. requiring no detectable gluten (i.e. a “zero tolerance”). sufferers from wheat allergy . D. Schuppan et al. guarantee that the product is free of contamination . H. J. Freeman, A. Chopra, M. T. Clandinin and A. 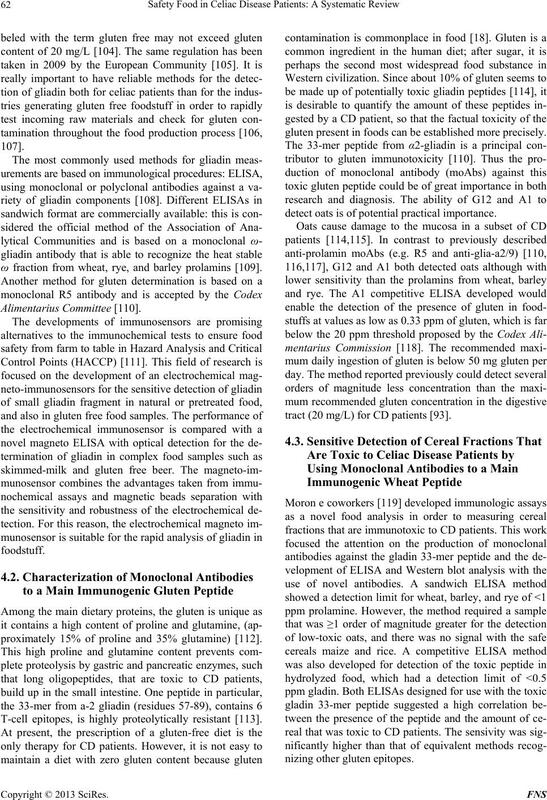 B. R.
Journal of Gastroenterology, Vol. 17, No. 18, 2011, pp. ease,” Immunological Review, Vol. 206, No. 1, 2005, pp. Journal of the American Dietetic Association, Vol. 97, No. No. 10, 2010, pp. 641-651. M. N. Marsh, “Studies of Intestinal Lymphoid Tissue. British Medical Journal, Vol. 2, 1954, pp. 1318-1321.
cal Gastroenterology, Vol. 40, No. 1, 2006, pp. 3-14. 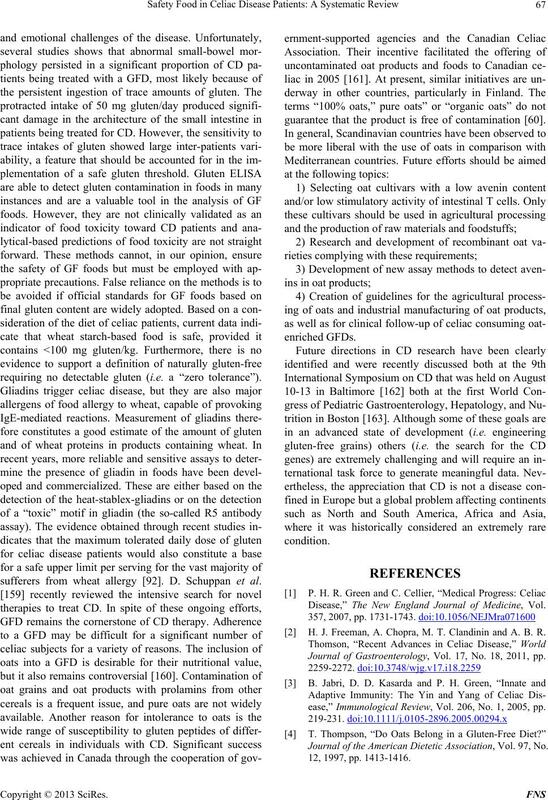 P. H. Green and B. Jabri, “Coeliac Disease,” Lancet, Vol. 362, No. 9381, 2003, pp. 383-391.
ology, Vol. 24, No. 2, 2007, pp. 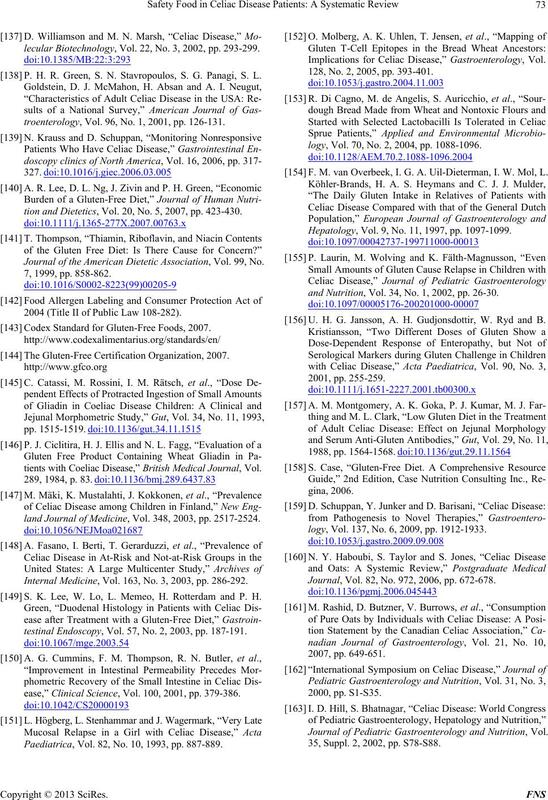 187-196.
and Therapeutics, Vol. 28, No. 9, 2008, pp. 1042-1066. Archives of Internal Medicine, Vol. 163, No. 3, 2003, pp. C. Dube, A. Rostom, R. Sy, A. Cranney, N. Saloojee, C.
troenterology, Vol. 22, No. 4, 2003, pp. 124-126. Sahara?” Lancet, Vol. 354, No. 9179, 1999, pp. 647-648.
old for Gluten Contamination in Gluten-Free Products. peutics, Vol. 19, No. 12, 2004, pp. 1277-1283.
trition, Vol. 60, 2006, pp. 358-363.
flammation, and Gluten Sensitivity,” JAMA, Vol. 302, No. “Coeliac Disease and Malignancy,” Lancet, Vol. 1, No. Vol. 97, 1989, pp. 265-271. Opinion in Gastroenterology, Vol. 24, No. 6, 2008, pp. peutics, Vol. 17, No. 4, 2003, pp. 587-594.
enterology, Vol. 19, No. 3, 2005, pp. 413-424.
testinal Endoscopy Clinics of North America, Vol. 16, No. pathy,” Scandinavian Journal of Gastroenterology, Vol. 37, No. 236, 2002, pp. 60-65. 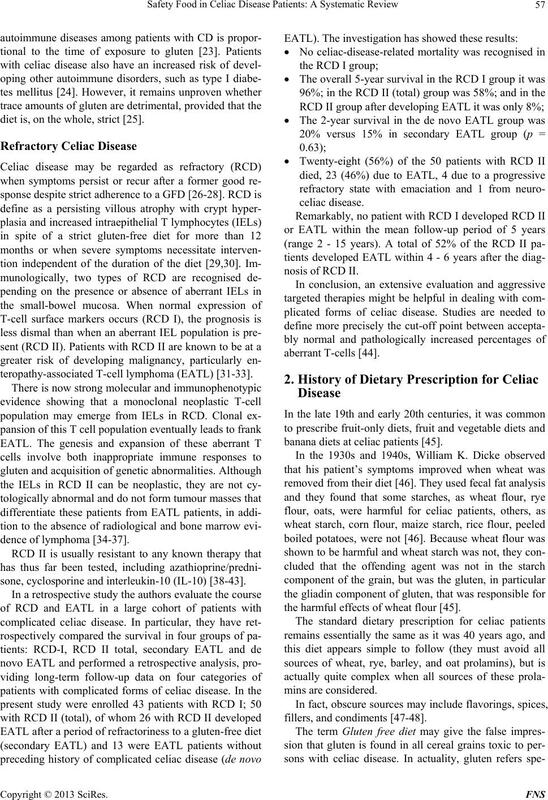 Cell Lymphoma,” Lancet, Vol. 356, No. 9225, 2000, pp. Hepatology, Vol. 13, No. 5, 2001, pp. 561-565. Journal of Clinical Oncology, Vol. 18, No. 4, 2000, pp. Gastroenterology, Vol. 39, No. 241, 2004, pp. 78-84. Vol. 96, No. 5, 2003, pp. 345-353. Vol. 32, No. 5, 2008, pp. 44-51. Gastroenterology, Vol. 114, No. 3, 1998, pp. 471-481. 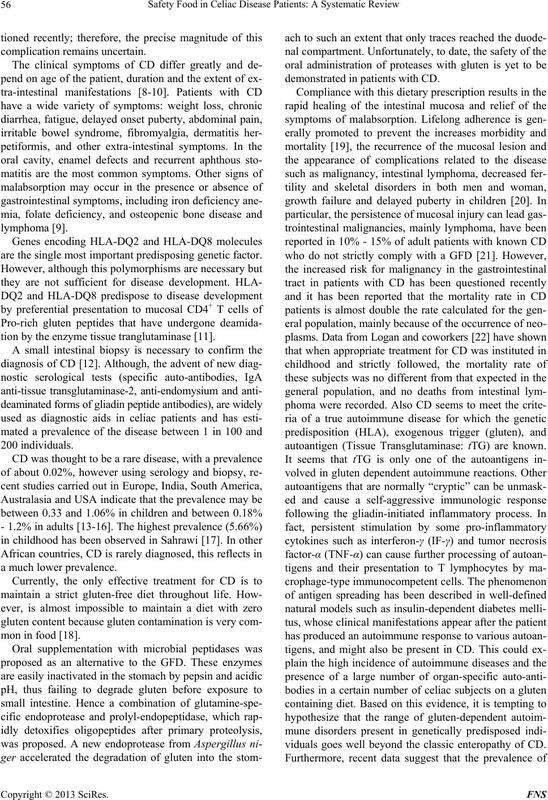 T-Cell Lymphomas,” Journal of Clinical Pathology, Vol. 48, No. 11, 1995, pp. 1045-1050. Pathology, Vol. 146, No. 2, 1995, pp. 509-519. Therapeutics, Vol. 18, No. 5, 2003, pp. 487-494. Gastroenterology, Vol. 95, No. 1, 1988, pp. 199-204. Vol. 119, No. 10, 1993, pp. 1014-1016.
macology and Therapeutics, Vol. 14, No. 6, 2000, pp. ogy, Vol. 97, No. 10, 2002, pp. 2595-2602.
perience,” Gut, Vol. 56, No. 10, 2007, pp. 1373-1378. Paediatrica, Vol. 42, No. 1, 1953, pp. 34-42. 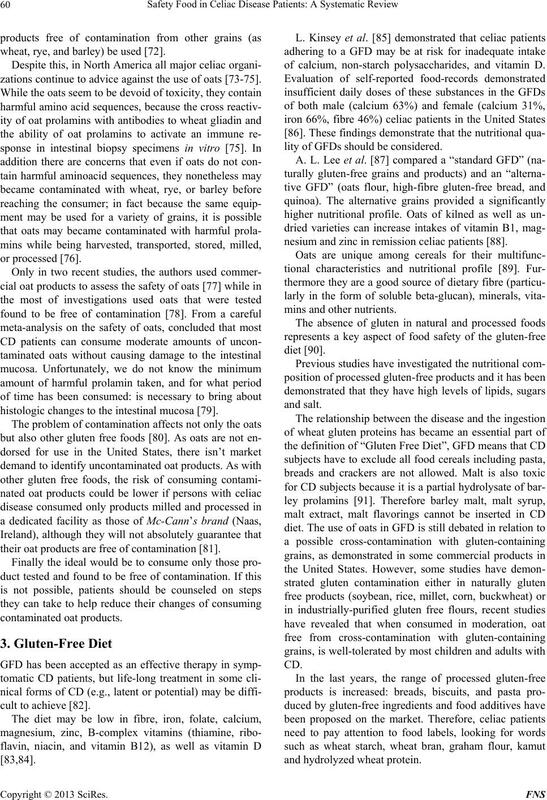 “Basics for the Gluten free Diet,” Omaha, 1994.
Review of Nutrition, Vol. 5, 1985, pp. 241-266. Nutrition, Vol. 53, No. 1, 1985, pp. 39-45. Vol. 20, No. 6, 2008, pp. 545-554. Alimentary Pharmacology and Therapeutics, Vol. 23, No. Journal, Vol. 82, No. 972, 2006, pp. 672-678. O. M. Pulido, Z. Gillespie, M. Zarkadas, S. Dubois, E.
Food and Nutrition Research, Vol. 57, 2009, pp. 235-285. No. 10, 2007, pp. 649-651. Contaminants, Vol. 28, No. 6, 2011, pp. 705-710. No. 4, 2011, pp. 359-364. Medicine, Vol. 333, 1995, pp. 1033-1037. Disease,” Gut, Vol. 50, No. 3, 2002, pp. 332-335. Scandinavian Journal of Gastroenterology, Vol. 39, No. Nutrition, Vol. 57, 2003, pp. 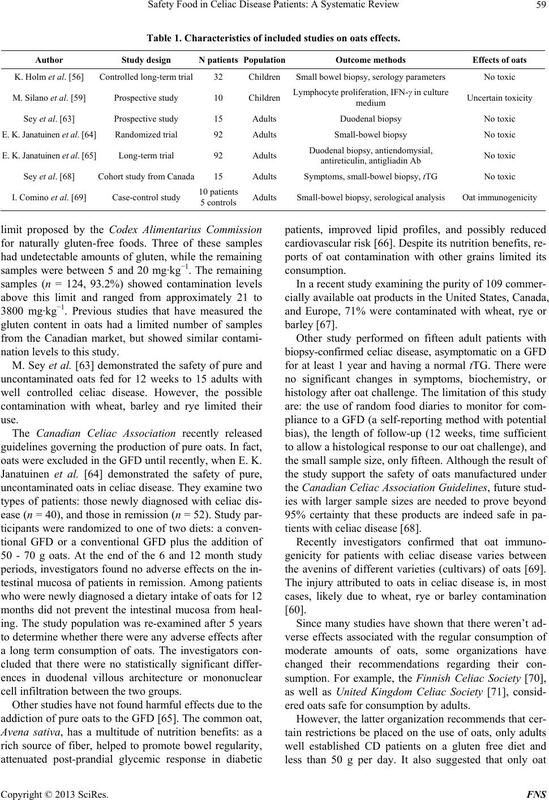 163-167.
ease,” Journal of Parenteral and Enteral Nutrition, Vol. 35, No. 4, 2011, pp. 459-464. Vol. 60, No. 7, 2011, pp. 915-922. The Finnish Coeliac Society, “Coeliac Disease,” 2002. 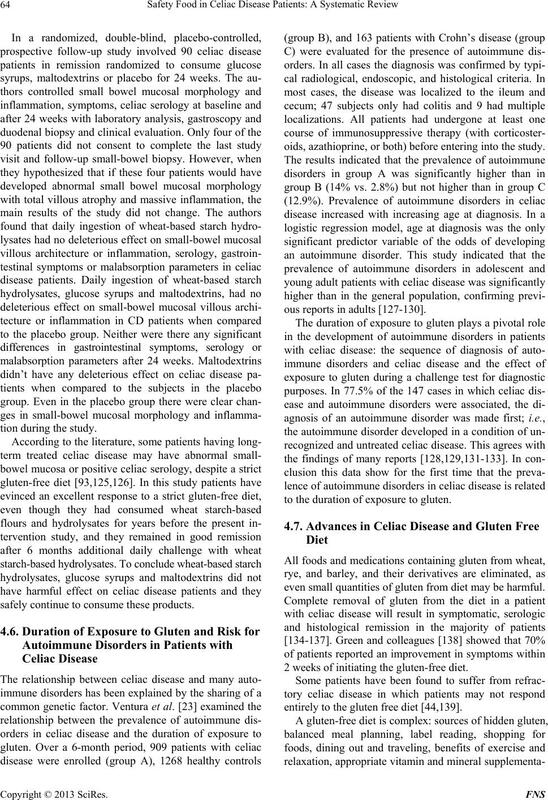 Coeliac Disease and Oats,” 2002.
sics for the Gluten Free Diet,” 1994. Canadian Celiac Association, “Food to Avoid,” 2002. U. Srinivasan, N. Leonard, E. Jones, D. D. Kasarda, D. G.
nal, Vol. 313, No. 7068, 1996, pp. 1300-1301. E. J. Hoffenberg, J. Haas, A. Dresher, R. Barnhurst, I. 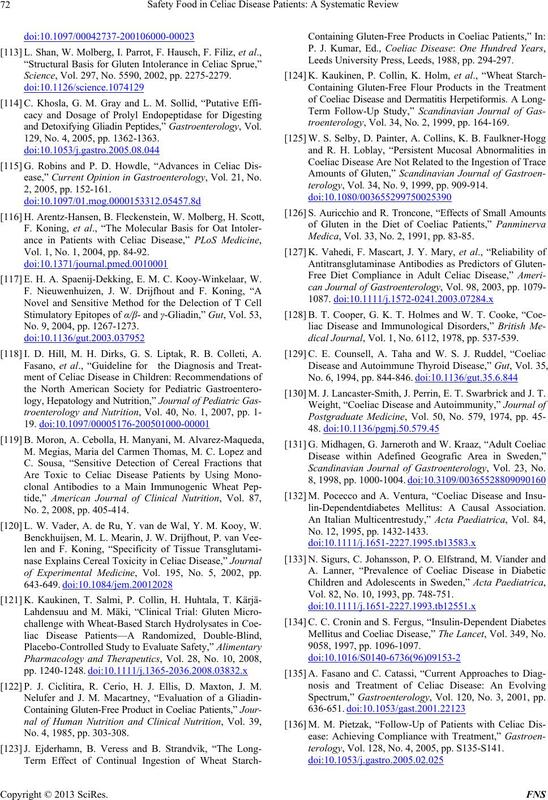 Journal of Pediatrics, Vol. 137, No. 3, 2000, pp. 361-366. Disease,” Gut, Vol. 46, No. 3, 2000, pp. 327-331. Vol. 101, No. 12, 2001, pp. 1456-1459. Canadian Food Inspection Agency, “Food Recalls,” 2002.
of Medicine, Vol. 351, 2004, pp. 2021-2022. Opinion in Clinical Nutrition and Metabolic Care, Vol. 11, No. 3, 2008, pp. 329-333.
tetic Association, Vol. 100, No. 11, 2000, pp. 1389-1396. Human Nutrition and Dietetics, Vol. 18, No. 3, 2005, pp. A. R. Lee, D. L. Ng, E. Dave, E. J. Ciaccio and P. H.
No. 4, 2009, pp. 359-363.
tion, Vol. 64, No. 1, 2010, pp. 62-67. No. 1, 2010, pp. 16-34.
tional Archives of Allergy and Immunology, Vol. 104, No. C. Hischenhuber, R. Crevel, B. Jarry, M. Mäki, D. A.
logy and Therapeutics, Vol. 23, No. 5, 2006, pp. 559-575.
nical Nutrition, Vol. 85, No. 1, 2007, pp. 160-166.
and Classification,” BMC Medicine, Vol. 10, 2012, pp. Loss?” Journal of the American Dietetic Association, Vol. 111, No. 11, 2011, p. 1786. No. 3, 2011, pp. 294-299.
sociation, Vol. 108, No. 4, 2008, pp. 661-672. Guide,” Case Nutrition Consulting Inc., Regina, 2006.
ciation, Vol. 103, No. 11, 2003, pp. 1533-1535.
ciation, Vol. 110, No. 6, 2010, pp. 937-940. Association, Vol. 108, No. 10, 2008, pp. 1682-1687. Official Journal of the European Union, 2009, L16/3. Patients,” European Food Research and Technology, Vol. 212, No. 2, 2001, pp. 228-233. H. M. Nassef, M. C. B. Redondo, P. J. Ciclitira, H. J.
Vol. 32, No. 9, 1997, pp. 940-947. 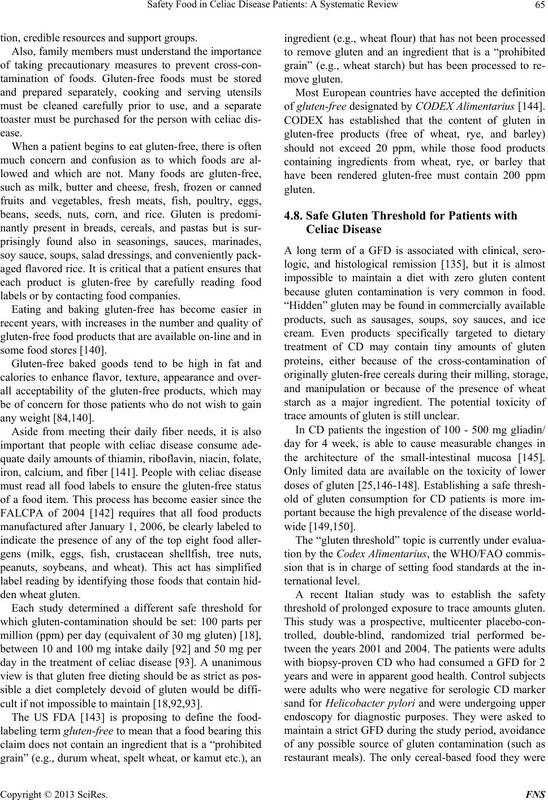 ‘Home Test’ to Detect Gluten,” The Lancet, Vol. 337, No. enterology and Hepatology, Vol. 15, No. 5, 2003, pp. ter 22, Elsevier B.V., Amsterdam, 2007. M. Stern, P. J. Ciclitira, R. van Eckert, C. Feighery, F. W.
and Hepatology, Vol. 13, No. 6, 2001, pp. 741-747. Science, Vol. 297, No. 5590, 2002, pp. 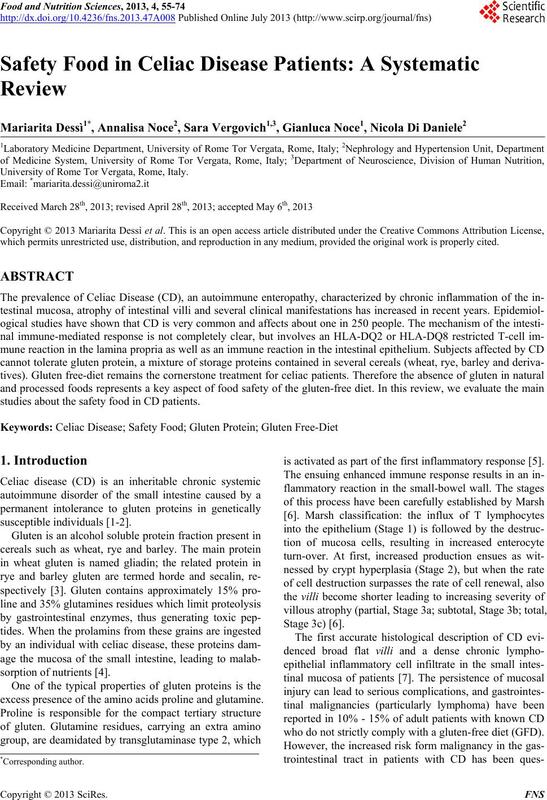 2275-2279.
and Detoxifying Gliadin Peptides,” Gastroenterology, Vol. 129, No. 4, 2005, pp. 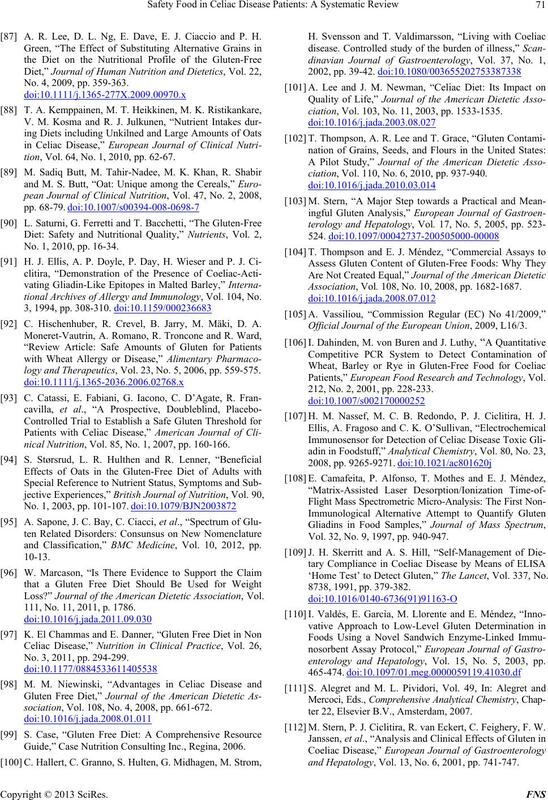 1362-1363.
ease,” Current Opinion in Gastroenterology, Vol. 21, No. Vol. 1, No. 1, 2004, pp. 84-92. E. H. A. Spaenij-Dekking, E. M. C. Kooy-Winkelaar, W.
No. 9, 2004, pp. 1267-1273. I. D. Hill, M. H. Dirks, G. S. Liptak, R. B. Colleti, A. No. 2, 2008, pp. 405-414. L. W. Vader, A. de Ru, Y. van de Wal, Y. M. Kooy, W.
of Experimental Medicine, Vol. 195, No. 5, 2002, pp. P. J. Ciclitira, R. Cerio, H. J. Ellis, D. Maxton, J. M.
No. 4, 1985, pp. 303-308. Leeds University Press, Leeds, 1988, pp. 294-297.
troenterology, Vol. 34, No. 2, 1999, pp. 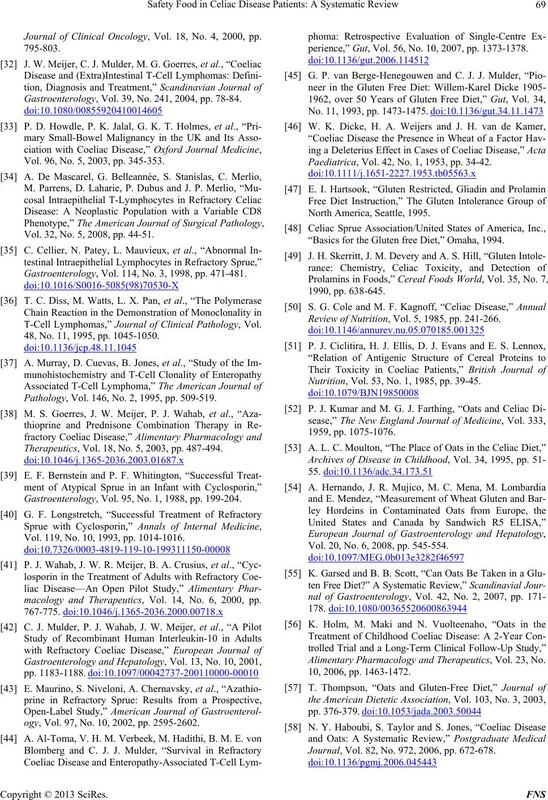 164-169.
terology, Vol. 34, No. 9, 1999, pp. 909-914. Medica, Vol. 33, No. 2, 1991, pp. 83-85.
dical Journal, Vol. 1, No. 6112, 1978, pp. 537-539. M. J. Lancaster-Smith, J. Perrin, E. T. Swarbrick and J. T.
Scandinavian Journal of Gastroenterology, Vol. 23, No. lin-Dependentdiabetes Mellitus: A Causal Association. No. 12, 1995, pp. 1432-1433. Vol. 82, No. 10, 1993, pp. 748-751. 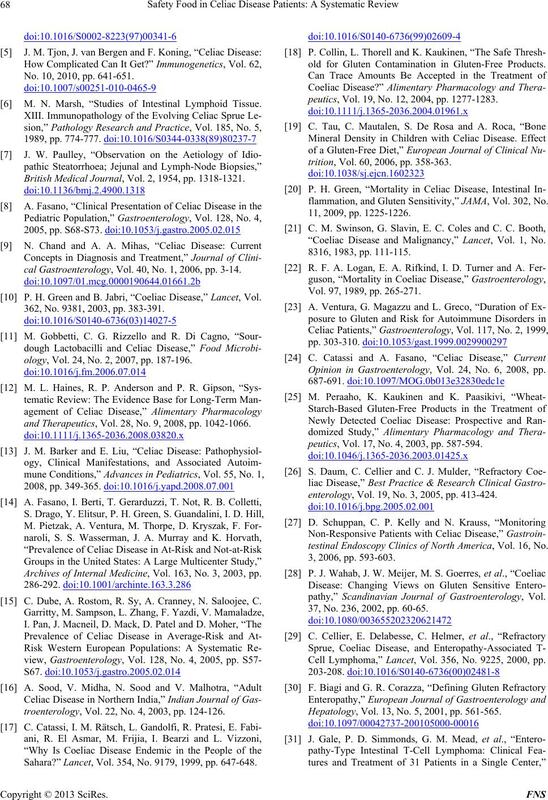 Mellitus and Coeliac Disease,” The Lancet, Vol. 349, No. Spectrum,” Gastroenterology, Vol. 120, No. 3, 2001, pp. terology, Vol. 128, No. 4, 2005, pp. S135-S141. lecular Biotechnology, Vol. 22, No. 3, 2002, pp. 293-299. P. H. R. Green, S. N. Stavropoulos, S. G. Panagi, S. L.
troenterology, Vol. 96, No. 1, 2001, pp. 126-131.
tion and Dietetics, Vol. 20, No. 5, 2007, pp. 423-430. 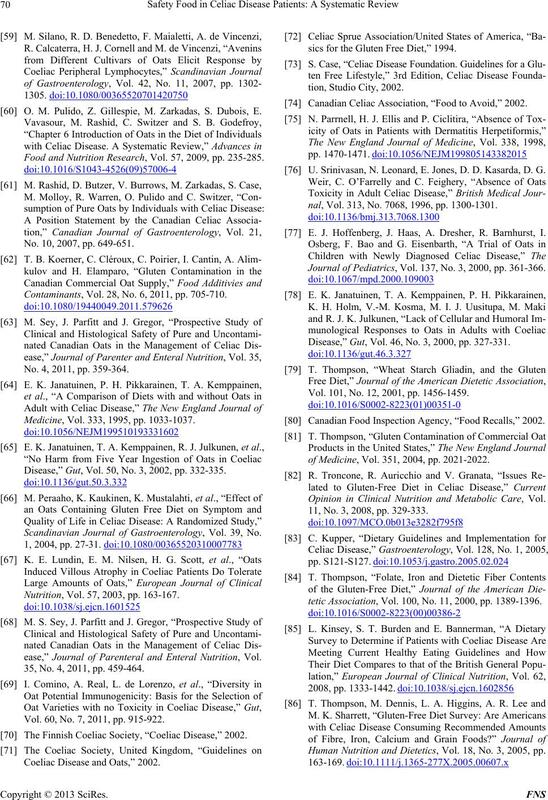 Journal of the American Dietetic Association, Vol. 99, No. 2004 (Title II of Public Law 108-282). Codex Standard for Gluten-Free Foods, 2007. The Gluten-Free Certification Organization, 2007.
tients with Coeliac Disease,” British Medical Journal, Vol. land Journal of Medicine, Vol. 348, 2003, pp. 2517-2524. Internal Medicine, Vol. 163, No. 3, 2003, pp. 286-292. S. K. Lee, W. Lo, L. Memeo, H. Rotterdam and P. H.
testinal Endoscopy, Vol. 57, No. 2, 2003, pp. 187-191.
ease,” Clinical Science, Vol. 100, 2001, pp. 379-386. Paediatrica, Vol. 82, No. 10, 1993, pp. 887-889. 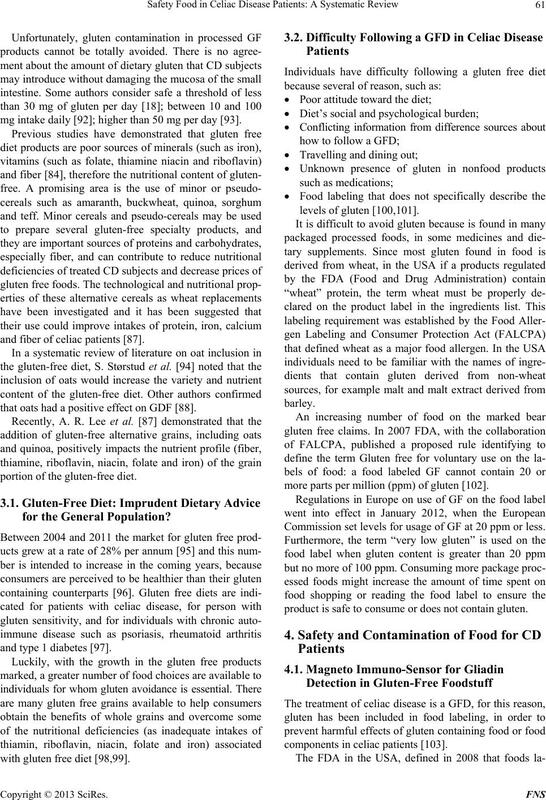 Implications for Celiac Disease,” Gastroenterology, Vol. 128, No. 2, 2005, pp. 393-401.
logy, Vol. 70, No. 2, 2004, pp. 1088-1096. F. M. van Overbeek, I. G. A. Uil-Dieterman, I. W. Mol, L.
Hepatology, Vol. 9, No. 11, 1997, pp. 1097-1099.
and Nutrition, Vol. 34, No. 1, 2002, pp. 26-30. U. H. G. Jansson, A. H. Gudjonsdottir, W. Ryd and B.
logy, Vol. 137, No. 6, 2009, pp. 1912-1933. Journal of Pediatric Gastroenterology and Nutrition, Vol. 35, Suppl. 2, 2002, pp. S78-S88.